2 × triple 21-inch (530 mm) Torpedo Tubes. 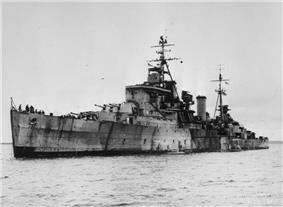 The Minotaur class of light cruisers of the Royal Navy, also known as the Swiftsure class, was designed as a modified version of the Crown Colony class incorporating war modifications and authorised in 1941, but, in spite of the heavy toll of cruisers in that year and the following one, the building of this new class had a relatively low priority and only three were completed by the war's end. They played no significant part in the Second World War, though Swiftsure, as flagship of the British Pacific Cruiser Squadron, was selected by Admiral Cecil Harcourt to hoist his flag for the Japanese surrender at Hong Kong. Superb was completed to a slightly different design. The class was originally to have consisted of eight ships, laid down in 1943, but by the end of the Second World War only Minotaur, Swiftsure, and Superb were complete, whilst the others were laid up. Minotaur was transferred to the Royal Canadian Navy and renamed Ontario. While the basic specifications and original armament were only a slight enlargement of the Colony class with an extra twin 4 inch turret, the Minotaur′s did represent a substantial advance towards more sophisticated weapon control and integration of command and control and AIO and developments towards operation room control of fighting ships. 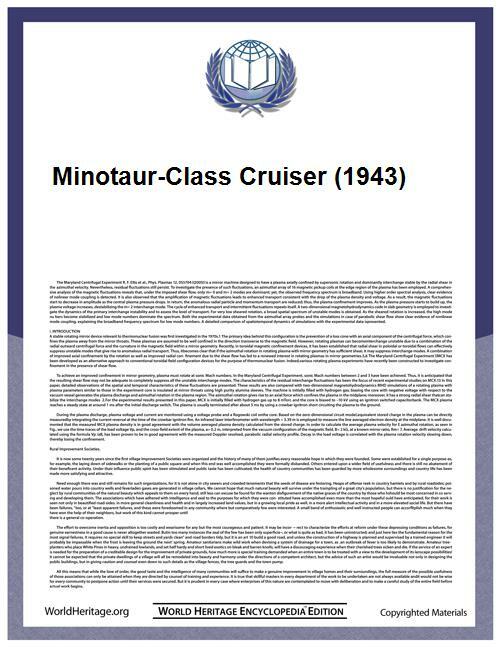 By 1944 the 7 Minotaur cruisers under construction represented four different groups, which were significantly different that they should probably be regarded as four different classes of cruiser. The Swiftsure introduced the reliable 274 lock and follow radar which increased the accuracy of the main armament to get on target fast. The second HMS Superb extended the more advanced radar with the addition of 275 to anti aircraft fire control although the Superb′s version lacked flyplane or the accurate finishing in the version fitted to later Battle class destroyers. The third group of Minotaurs, the Tigers were being built from quite early in their evolution with a quite different main battery, of three triple MK 24 6 inch turrets which were DP elevating to 60 degrees and automatically tracked and followed targets under 274/275 radar control, these guns and those for HMS Hawke, the fourth Tiger were near complete by late 1946 and were stored at Rosyth, until the late 1950s as alternatives to the Mk 26 automatic twin 6 guns ultimately fitted as replacement. Hawke represents a further development, surprisingly scrapped on the slip in late 1945, with its boilers and machinery complete, and its guns nearly finished. Three of the laid-up vessels were completed in the 1960s as Tiger-class cruisers. Two went on to be further converted into helicopter and command cruisers during the 1970s. Swiftsure was completed with sixteen twin and six single 20 mm guns, but had all the singles and eight of the twin removed in the summer of 1945, when she received, in lieu, eight 40 mm Bofors and five single 40 mm Bofors Mk III. HMCS Ontario (ex-Minotaur) was completed with the same close-range outfit as Swiftsure, and is reported to have had an outfit of six 40 mm and six 20 mm guns at the end of the war, all in single mountings. Superb was not completed until after the end of hostilities, and had a close-range outfit consisting of eight single 40 mm Mk III, two single 2-pounders, four twin hand-operated 20 mm and two single 20 mm guns. After a collision between HMS Swiftsure and the destroyer HMS Diamond in the West Indies on 16 September 1953, the Swiftsure was largely rebuilt to the pattern of the Belfast class reconstruction in 1956-59. The work on the Swiftsure was largely complete. However it was placed in reserve rather than fit it out with the only available armament, of its original labour-intensive, triple six inch guns, two twin 4 inch and a pair of L/60 Bofors which would have been controlled by a 6 channel MRS8 US supplied fire control system. The 1953 plan to modernize the ship with the new twin 3 inch 70 guns  was rejected by about 1954 because HMS Swiftsure′s beam of 63 feet didn't allow enough space,and the cost of a full reconstruction of Superb as a fourth Tiger, with its full new armament was far too expensive. The new 70 calibre twin 3 inch mounts were experimental and it was far from clear they would ever be reliable enough to be effective. A more limited update of the Swiftsure and Superb with new L/70 proximity fused Bofors were approved and cancelled, because the time and cost of Swiftsure′s modernisation, was proving too great and it was clear, to fit 4 L/70 mounts needed conversion from DC to AC power and was too expensive on half-life ships. Options of the 965 radar on its new lattice mast and a data link were considered. The cost of finishing the Tiger cruisers (35 million pounds) was a major political issues, as was the new automatic guns jamming, partly rectified by 1958, after terminal damage to the credibility of the project. The completion of Lion and Blake was in real danger of being stopped in early 1960 and automatic gun cruisers were considered obsolete in the US and Soviet Union. Problems with cracking that occurred in the update of the Swiftsure as a result of the collision with the destroyer HMS Diamond, slowed the refit, raised costs and made recommissioning at the same time as the Belfast impossible. Reentering service in 1960 with only WW2 cruiser weapons was too expensive,with no suitable modern weapons to fit and more than 1 million pounds having been spent on the Swiftsure 'reconstruction' by early 1959, on mainly structual modifications rather than weapons and electronics. In 1959-60, the Royal Navy fought hard to retain the Swiftsure, to a new modernisation pattern as a Cruiser - helicopter carrier. To to a design which was largely implemented a decade later on its half-sisters HMS Tiger and HMS Blake. This was intended to allow more space on carriers for fighters and strike aircraft. NOTE: There appears to have been a ninth member of the class, HMS Mars, but apart from the fact she was cancelled in 1946, her history is uncertain. In 1959 Triang Minic Ships produced a series of 1:1200 (one inch to 100 feet) metal models of these ships, carrying the names Swiftsure and Superb: these toys were mass-produced in large numbers between 1959 and 1965, and served to publicise the post-war navy to a new generation. In 1960 the Airfix company produced an accurate HMS Tiger plastic model kit to a scale of 1/600th (one inch to 50 feet), and in 1961 Frog (models) produced a version to a larger scale of 1/420th. Matchbox briefly issued a 1/700 scale waterline kit of the HMS Tiger as refitted into a helicopter cruiser. The Aifix kit remained in production until 2001; just under fifty years. ^ D.K. Brown. Rebuilding the RN- Warship Design since 1945. Seaforth(2012) UK, p 19, 47 re HMS Hawke and Mk 24 triple DP 6 inch. ^ D. Brown. Rebuilding the RN, (2012), p19. ^ D. Murfin. AA to AA. The Fijis Turn Full Circle. Warship 2010 p57. ^ UK Hansard 6/2/1961.Question HC. Captain Kerby to Mr Orr Ewing. ^ Murfin. AA to AA.The Fijis Turn Full Circle. Warship 2010, p56.